"It's literally throwing away hundreds of millions of dollars," Al Tadros, vice president of space infrastructure and civil Space at a company called SSL, said this month at a meeting in the US capital of key players in the emerging field of on-orbit servicing, or repairing satellites while they are in space. In 2021, his company will launch a vehicle—as part of its Robotic Servicing of Geosynchronous Satellites (RSGS) program—that is capable of servicing two to three dozen satellites in a distant geostationary orbit, some 22,000 miles (36,000 kilometers) from Earth where there are about 500 active satellites, most in telecommunications. Tadros describes it as "equivalent to a AAA servicing truck in geostationary orbit." And "it's financially a very, very big opportunity," he adds. 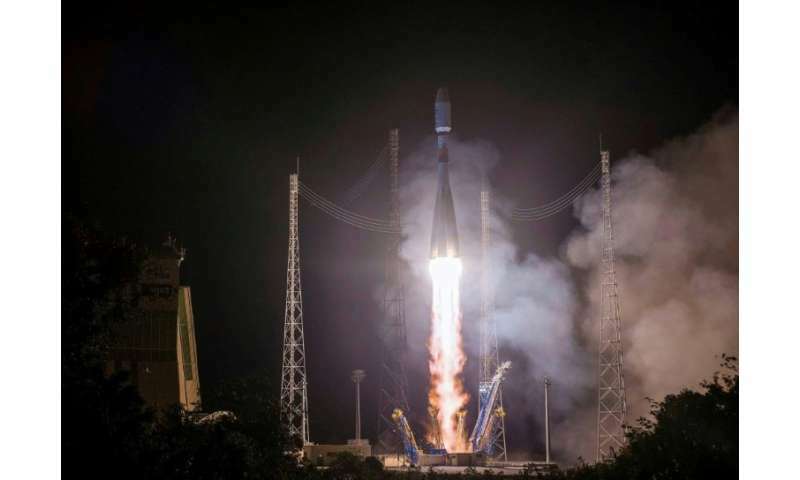 Telecommunications giant Intelsat, which operates 50 geostationary satellites, chose a different option and signed a contract with Space Logistics, a branch of Northrop Grumman, for its MEV, a "very simple system" vice president Ken Lee told AFP is much like a "tow truck." The rest—which move at speeds of some 12-19,000 miles (20-30,000 kilometers) per hour—includes nearly 3,000 inactive satellites, 2,000 pieces of rockets (such as the second stages of rockets) and thousands of fragments produced by two key events: the deliberate missile explosion of a Chinese satellite in 2007, and the 2009 collision of an Iridium satellite with an aging Russian one. Since 2008, France has required satellite operators to take steps to "deorbit" their spacecrafts by programming them to re-enter Earth's atmosphere in 25 years so that they burn up, according to Laurent Francillout, head of space security at the French National Center for Space Studies (CNES). When it comes to satellites in geostationary orbits, their end-of-life option is to go farther from Earth to a "graveyard orbit" 200 miles (300 kilometers) further away. "We are trying to promote these principles" in other countries, Francillout told AFP. Though it doesn't have a clientele yet, director of operations Chris Blackerby anticipates the business would be "very viable." Airbus's future "Space Tug," planned for 2023, is being built to grab old satellites and push them down to 125 miles (200 kilometers) above Earth so they burn up. "We don't want the Wild West," said Fred Kennedy, director of the Tactical Technology Office at DARPA, the technological research arm of the Pentagon, noting that the United States, with its fleet of military satellites, is keen to establish sound practices beyond the boundaries of Earth. Removing space junk is something that will end up being the biggest job. Its a vicious circle, with each collision producing thousands more fragments, each of which increase collision danger, etc. Eventually this is something that will have to be taken care of. No way around it. Just tell trumpenella that the collected material would be used to build an orbiting gplf course! Tell the vp "warm bucket of spit" pennyfoolish that the collected material would make a very shiny orbiting crucifix. I have no idea what Acting President Melanie would want to accomplish with the conglomerated material. Hey, she could ask Barron for ideas! I'd bet he'd come up with a couple of interesting possibilities. No need to bother asking his siblings. They'd just give you the dull glare of the perpetually brain-dead. The Zombie Apocalypse starts at the WH. At the White House. Emphasis on the white. Of the 21,000 pieces of useless space debris, 16,000 came from just one missile and three satellites! Any future conflict, even just between regional superpowers, could easily end up targeting numerous communications and reconnaissance satellites on both sides. . . Better still: to build a wall to keep out aliens. Yeah it'll be him or a similar entrepreneur who builds the first multipurpose laser station in orbit. Govt contracts to deorbit junk will pay for it. Providing beam propulsion around the inner system will buy him his own moon. Phobos perhaps. This is equivalent to cleaning mines from harbors and fields. Again, a laser platform would do the job. Good excuse for an ambitious profiteer to build one as well. These platforms are inevitable. Eventually there'll be huge stations on or near mercury providing beamed power and propulsion all around the system. And I dont think govts will be allowed to have them because they make dandy weapons. Closer to the sun the better. "Also, being the closest planet to the Sun, Mercury has vast amounts of solar power available, and there are predictions that Mercury's soil may contain large amounts of helium-3, which could become an important source of clean nuclear fusion energy on Earth and a driver for the future economy of the Solar System." -We're already working on high temp PV with potentially greater efficiencies than regular PV. "High concentration photovoltaics (HCPV) systems employ concentrating optics consisting of dish reflectors or fresnel lenses that concentrate sunlight to intensities of 1,000 suns or more... Multi-junction cell efficiency has now reached 44% in production cells." -Power can be beamed around the system with laser or maser tech. -This is not my idea. I may have gotten it from a Kim Stanley Robinson book. We're already working on high temp PV with potentially greater efficiencies than regular PV. Why work with PV? Mercury has the smallest axial tilt of any of the planets, so you can land at either of the poles and set up a very large steam engine between the light and dark sides of the planet. You just lay pipes radially out from the pole, and put methane inside the pipes - it turns to liquid at the night side, and boils and expands on the day side. Then you install a gas turbine at the hub, and make electricity. Since the planet is rotating very slowly, you run the boiling gas from the day side to another pipe just over the horizon, and once that pipe fills up it liquid methane, it rotates over to the day side, and you switch the valve to the next pipe over the horizon. The planet is your pump. The day side is +427 °C and the night side is −173 °C which means that an ideal heat engine would operate at 85.7% efficiency. Far better than any solar panel. The "ParaSols" should be orbited at Solar North and South. First, not handicapped by planetary rotation or ephemerides. At either end of the power beam. Or by locating the devices in a gravity-well. Second, lofting the materials out of the planetary disk would reduce the risks of collisions with randomly rocks & rolling jetsam. And being located so far apart, a disaster to one collective of sunshine collectors would leave the other to maintain coverage. Third, from Sun Polar positions our entire Solar System could be covered for energy needs. All you need to do is steadily keep adding new power collectors. Fourth, avoid the danger of aiming directly at a planet. The power beams aimed at relay collectors & distribution emitters. Thats a lot of plumbing to fuss with on an airless planet. Can it approach the sq mi collecting potential of HCPV? You have unlimited room in space for HCPV for collecting gigawatts of power and beaming it anywhere you want. And you can get as close as you want to the sun to maximize collection.